When Myrna found this cookbook on sale, she showed it to me, and I had to buy one right away! My husband enjoyed looking at the photos and choosing what he thought I should make and I enjoyed the wide variety of recipes and abundant “how-to” tips and photos throughout the book. It starts out with choosing kitchen cook and bake ware, cutlery, and goes on to knife skills, measuring, pan substitutions and gadgets in a kitchen basics chapter, then covers everything from bread to game, beans to desserts, and everything in between. The photos are great – just mouth-watering. 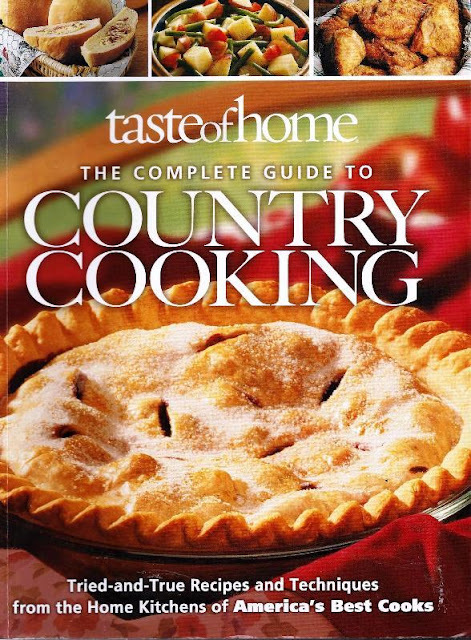 I would have to add Taste of Home’s The Complete Guide to Country Cooking to any list of good, basic cookbooks for gals who want to get more out of their kitchens and learn to cook from scratch. The recipes use very few convenience foods and make good use of garden produce and herbs. I didn't know they updated this book. I have the 1998 copy. If it is close to the same, it is a good one!! I think I will try to find it and play along with you. Love to have you with us. It really is a good cookbook.